E3 2012 as come and gone, it's been a month but I remember it like it was yesterday. We saw a lot of cool stuff and now have a full year of exciting gaming ahead of us. Being my first E3, I also learned a lot of things about the expo itself. I'll share a couple of tips with you so that the E3 noob can have the best experience possible whenever the chance appears. It seems obvious but it's also pretty important. There is so many games and stuff to see at E3 that you'd be hard pressed to remember everything you've played. Just a basic notepad and a few pens will do the trick. Just try a game or two and write down some general impressions. You'll be happy you did it when you try to remember a day later, especially if you're blogging your experience. E3 is big. There's two main hall and they are full of games, accessories and babes. I actually got lost once, not sure in which hall I was and how to get to the Nintendo booth. I ended up in the huge crowd of hockey fans waiting for the Kings' game that night. If you're alone it's not that bad but if you're in a group, there's a good chance that you'll get separated. That's where the cellphone comes in. Just a couple text messages and you can easily meet at any booth. As an added bonus, some of the free goodies was only available if you liked a certain page on facebook so you're in luck if you have a smartphone. Again, E3 is a big place and there is a lot to see. Before the event start, there's always a way to find a map of the showfloor and you also get a magazine every morning with a couple articles, a map and a list of every company with show space inside. You can just walk around a try to see everything you want but you might lose some precious time. Having at least a little preparation will help you see what you really want. You can also use the first day to see where are the longest lines and choose when do you want to tackle those lines. That's an idea I wish I had before going to L.A.! Thoses three days of walking and standing around will make your leg and back pretty tired. 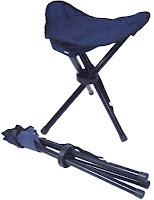 Having a small chair in your backpack and taking it out while you're waiting to play might save your back and help you make it through the event a bit easier. I guarantee a lot of people will comment "A chair. That is brilliant." If you happen to own an Android tablet, an Ipad or any other kind, you can knock off a couple of my tips in one go. These days, tablets have pretty good cameras for photos and videos, can go online and with a little practice on the keyboard, you can write down notes pretty efficiently. So if you have one, you only need to plan your trip, take a chair and you'll be all set!